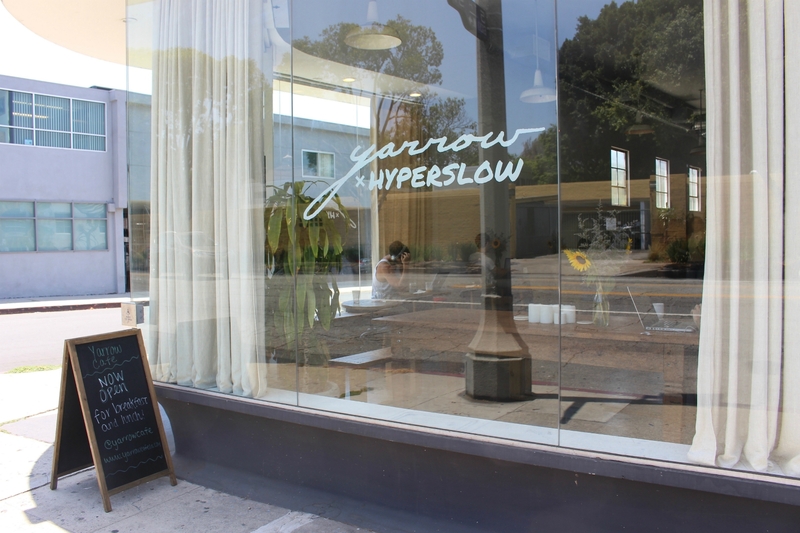 When chef Royce Burke came up with the idea of launching the meat-free Yarrow Cafe in Beverly Grove, it was partly to address his frustration with the current state of vegetarian food in Los Angeles. Burke (Secret Lasagna, Chimney Coffee) isn’t vegetarian or vegan himself. In fact, he loves eating meat. He does, however, have a longstanding love affair with produce. As a kid, Burke dreamt of becoming a farmer when he grew up. He ended up studying winemaking with a focus on viticulture and oenology in college in Napa Valley. If you happen to be sitting at Yarrow Cafe when a delivery of vegetables comes in, you might find Burke behind the counter giggling like a child who just unwrapped a birthday present. His passion for vegetables is exhibited in the playfulness of his dishes. The stand-out items at Burke’s new shop, which took over the front cafe space that Hyperslow yoga previously ran (the workout studio still operates in the back of the building), are his whimsical carrot tartine and breakfast burrito. The carrot tartine, which Burke admits has a “very ostentatious name,” is meant to replace the ubiquitous avocado toast that he feels has been “overdone.” It’s a very Instagrammable dish. 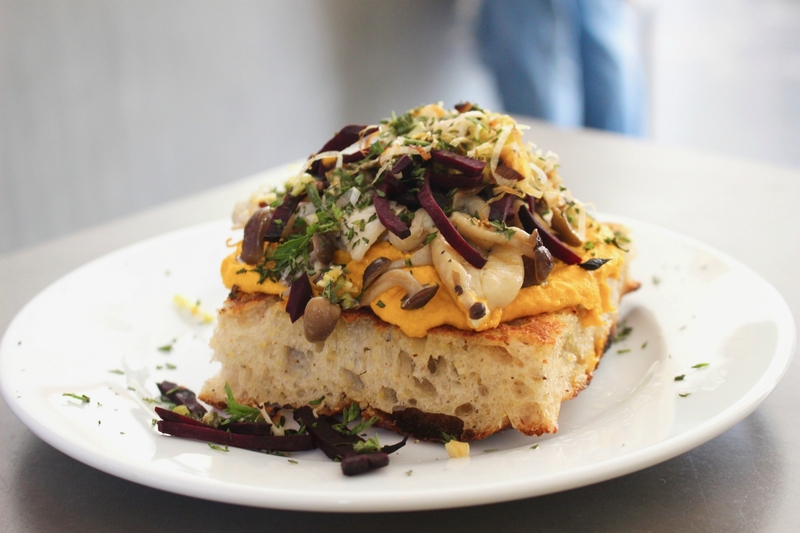 A vibrant orange spread of roasted carrot-rosemary puree rests on a thick slice of Bub and Grandma’s bread. It’s piled high with seared Beech mushrooms (aka buna-shimeji), roasted beet strings and crispy leeks for texture. It’s then finished with fennel pollen. “This is better than avocado toast and it’s more interesting and nobody [else is] doing it,” he says. Burke is no stranger to whipping up intriguing breakfast concoctions. 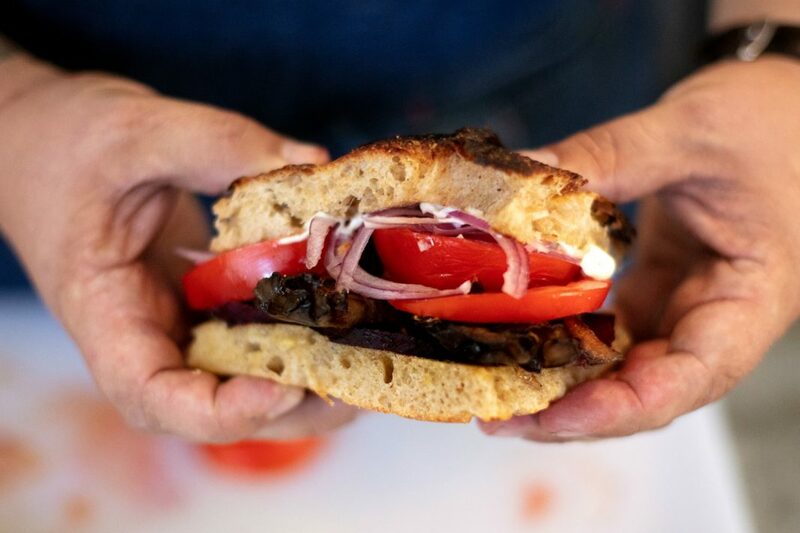 After all, he created the menu for Chimney Coffee in Chinatown, employing ingredients like Japanese milk buns, and making his own cured bacon and black-truffle pork sausages. 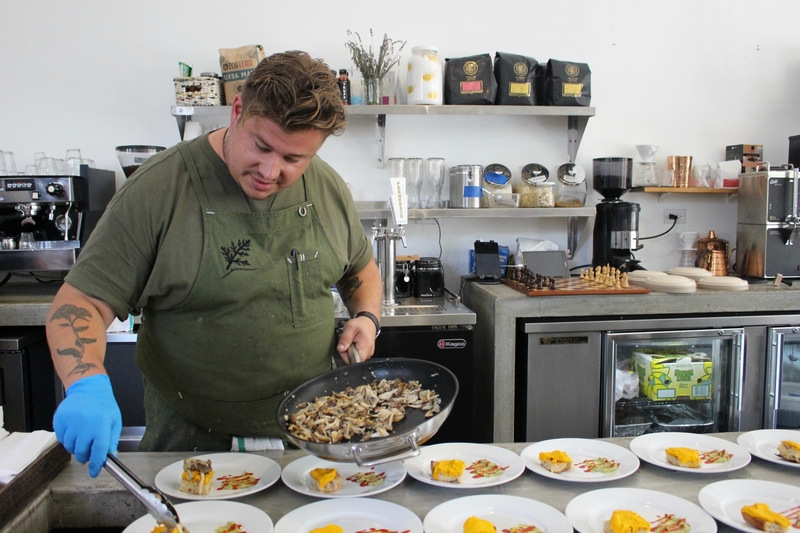 With Yarrow Cafe, he wanted to tackle one of L.A.’s favorite dishes, the breakfast burrito. Burke felt that if he could create a unique vegetarian version of it—one that even people who like bacon breakfast burritos craved—then it would mean that he was doing something right. 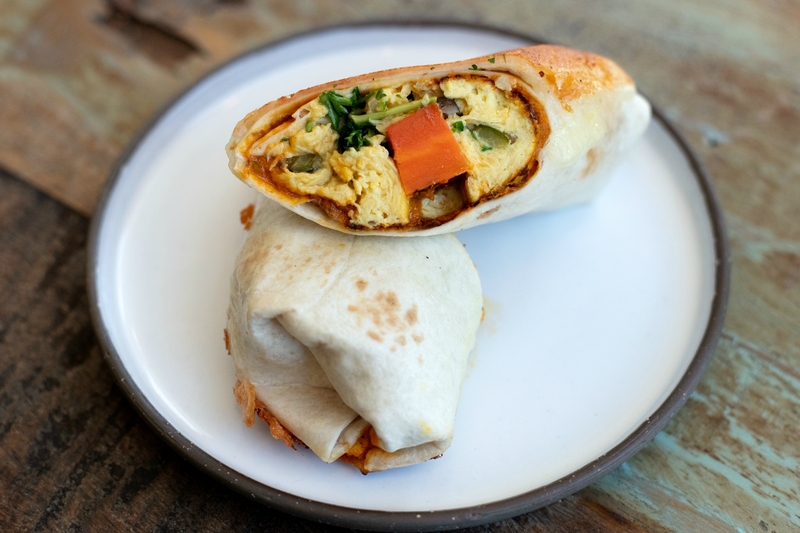 His breakfast burrito also has a spread of carrot-rosemary puree and the tortilla is rolled around scrambled eggs and a medley of roasted vegetables, including carrots, cauliflower, zucchini, and mushrooms. It’s complemented by a charred lemon Romesco sauce, and the outside of the burrito is shrouded in a crisp layer of Monterey Jack cheese for an added touch of umami. When Burke set out to open Yarrow Cafe with partner Steve Lau—formerly the general manager of the New York and L.A. locations of celebrity chef Eddie Huang’s Baohaus—he envisioned a rustic French country cafe that would channel his grandmother’s culinary roots. But that all changed when he realized that his experiences over the years cooking Thai, Chinese, and Filipino cuisines had changed him. He was no longer able to cook just one type of food anymore. Named for the eponymous flowering plant, the cafe occupies a stark-white industrial space punctuated by vases of fresh yellow sunflowers on each table and tan, velvety armchairs. Burke says he’s always loved yarrow because he used it as a remedy for headaches growing up. He respects it so much that he even has a picture of it tattooed across one side of his right forearm. “I just had a really strong connection to it and when I decided to go plant focused for my next project, it just stuck with me,” Burke says. When Yarrow Cafe was in its planning phase, Burke knew he wanted pastry chef Beth Kellerhals on his team. Kellerhals, who also runs the biscuits-centric concept Good Gravy Bakes, previously worked at places like the Pie Hole and collaborated with chef Roy Choi on many of his projects, including creating his Chego restaurant’s signature tres leches cake and Sriracha bar desserts. Burke’s and Kellerhals’s friendship grew over their mutual love of breakfast. Kellerhal, who grew up in Chicago, says her inspiration for Yarrow Cafe’s desserts comes from her love for the Midwest, but through a Southern California lens. “I really wanted to make [the desserts] accessible with L.A. language and make them relevant for what anyone would find in their kitchens in L.A., [like] matcha and chlorophyll,” Kellerhal says. 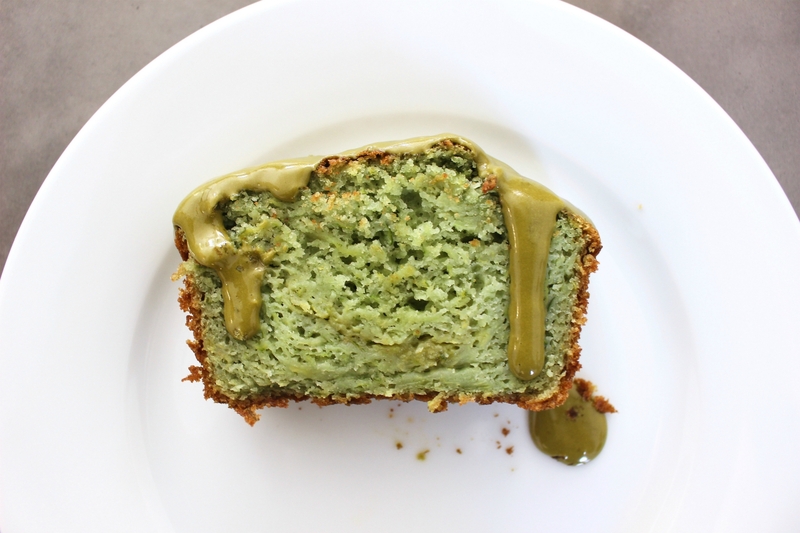 Her vegetarian Good Goddess Slice is a moist roasted zucchini bread made with chlorophyll that has a matcha glaze cascading over it. Kellerhal gives respect to the blondie bar, which she says gets a bad rap and is often “seen as the brownie’s ugly stepsister,” by elevating it with brown butter and warm chai spices. Her vegan breakfast bar is a next-level luscious take on the Nutri-Grain bar, made with sliced coconuts and oats and sandwiched around a heap of raspberry jam. And her vegan blueberry polenta is a healthier rendition of the beloved blueberry muffin, but this one is coated in a thyme-tangerine glaze. With the coffee and tea program, Burke brought on Jack Benchakul of Endorffeine in Chinatown. Benchakul created the straightforward drinks menu for Yarrow Cafe, which includes pour overs, cortados and matcha lattes. Yarrow Cafe is currently using beans from Portland, Oregon, roaster Roseline Coffee and teas from Chicago-based company Spirit Tea. Benchakul and Burke bonded over their shared love of coffee. It’s been a daily ritual for Burke to get a cortado at Endorffeine, and he says he realized that when Yarrow Cafe opened, he wouldn’t be able to stop by Benchakul’s cafe every morning anymore. “I was like, I need him to train my staff and put the coffee program together because if I can’t have his cortados, then I need people trained by him to make his cortados,” Burke says, jokingly. As the seasons change, there will be slight tweaks to Yarrow Cafe’s breakfast-and-lunch menu, but staples like the breakfast burrito and carrot tartine will remain on the indefinitely. Burke is currently also working with Lau to relaunch Secret Lasagna, his delivery-based concept that he closed this year after plans for a brick and mortar fell through. His lasagna and comfort-food concept might even make a limited appearance at Yarrow Cafe at some point. But for now, everything is in its place in this little slice of plant-based heaven on Fairfax Avenue.